Live Industrial represents Cousins Packaging as their exclusive sales and service distributor in Australia. Live Industrial introduces the new LP2100X-A low profile automatic rotary turntable stretch wrappers featuring the revolutionary A-Arm to their range of stretch wrapping machines. Cousins’ exclusive patent-pending A-Arm technology boosts productivity, saves money through reduced labour and improves safety through minimal operator involvement. The A-Arm cuts and attaches the film at the top of the load eliminating dragging tails. A simple design incorporating fewer moving parts also enables minimal maintenance requirements. The automatic stretch wrappers are designed with a heavy duty 2.2T capacity turntable and are capable of wrapping up to 35 loads per hour. 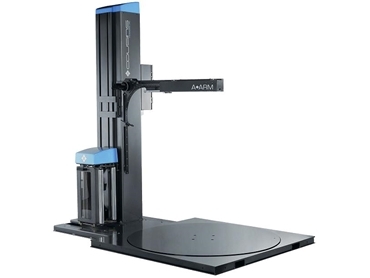 The Accu-Count exact turntable positioning system allows additional film savings during the wrapping process. Safety features include carriage descent obstruction emergency shut-off system, carriage anti-fall device and A-Arm anti-fall device. The LP2100X-A low profile automatic rotary turntable stretch wrappers are suitable as low-cost high-quality automatic stretch wrapping machines for all packaging environments.